For those who would rush out and pre-order the audiobook just to hear the Shat speak Esperanto, you should know there is no guarantee the Shat followed my humble advice. I’m pretty sure I never mentioned here that I’m an amateur woodworker. That’s VERY amateur. One of the hardest things to find is a small project, I.E. not requiring great quantities of wood, that are interesting, and/or actually useful. There are two people on YouTube who I watch in the hopes that they will present something appropriate. First and foremost is Steve, on WoodWorking for Mere Mortals. The other is Teen Wordworker. 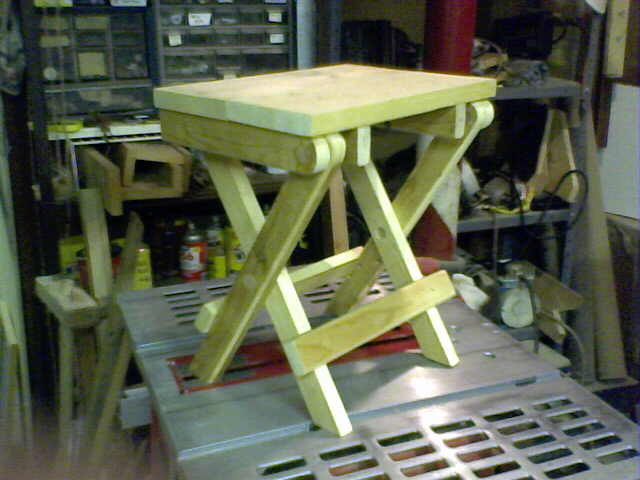 Steve actually came up with something cool a few videos back, a folding stool/seat. This was a great project as it basically uses up some of those scraps of wood that are less that 20 inches long. 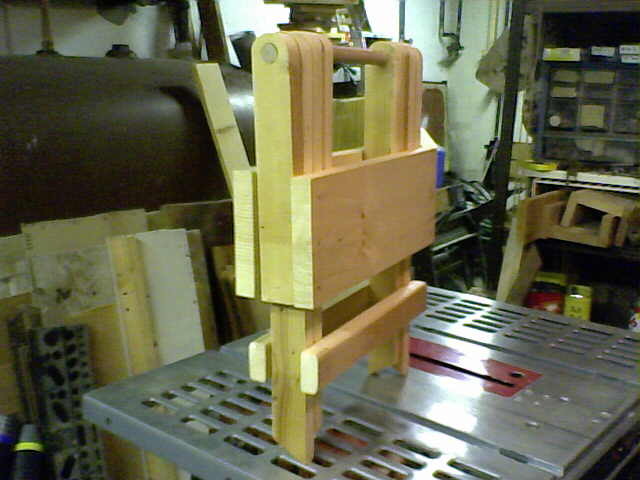 I’ve got a long way to go because I’m still in basic joinery, nothing fancy. Just wish I knew where to find simple, but cool projects. Esperanto Shirts: an Economic Indicator, or Just in Season? 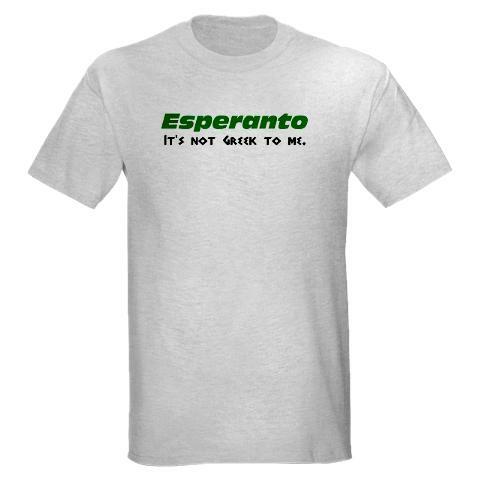 I believe I previously mentioned that I design shirts with Esperanto words/slogans on them and offer them for sale through Cafepress. Several years ago I was selling enough that I got a trickle of cash, then a long dry spell. Now they’re selling again, at a trickle, but for something that just sits there until noticed, I don’t mind. I’m wondering if it in any way reflects on the economy. Just before the last presidential election, it seemed that I was suddenly getting more orders from other countries. Now I’m back to stronger domestic sales. The shirt above is one of my recent favorites and I find myself wearing it more than my several others. If you want to find my shirts on CafePress, here’s a secret to save a few dollars. CafePress has two places to find their shirts: a ‘Marketplace’ which charges their premium prices,and the individual shops which are ruled only by the owner’s markup. Unfortunately, the shops can only be reached through a direct link, not through the marketplace. So, first you go to CafePress and search for the word esprimoj. If you find a design you like, send the URL of the shirt to me at nj.esperantist@gmail.com. I will then send you a URL from my individual shirt shop instead of the Marketplace at CafePress. This generally saves you about 2 dollars. In my shops I generally mark my shirts up about $2. In the marketplace I receive 10% of the CafePress selling price which with the recent price hike, is a little more than $2. Either way I come out OK, but contacting me saves you a few dollars. Christopher Mihm’s next film is now in pre-production. His last film Attack of the Moon Zombies, included an Esperanto soundtrack recorded by volunteer Esperantists across the U.S. 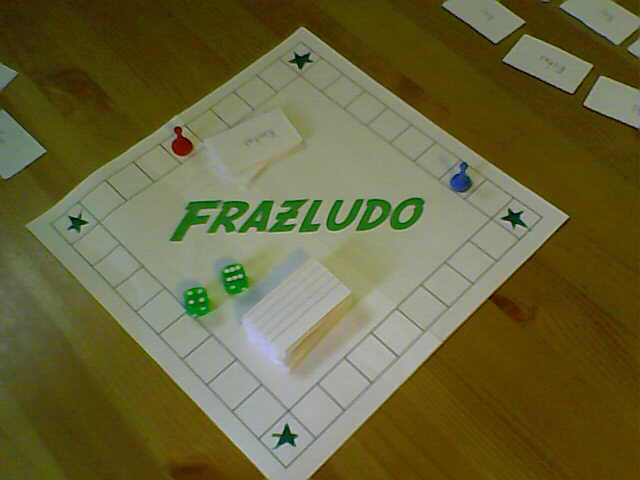 This coming production will also have an Esperanto Dub track and I have been asked to be on the team of Translators. Hura! The quality of this translation and dub should be of even better quality than the last because we’re already more organized. The last project we admittedly just dove right into. If you’re at least adequate in Esperanto and want to help, I can put you in touch with our project leader, George Baker. A place I frequent purchased several of those satellite controlled atomic clocks with the idea that they would keep better time and not require the arduous re-setting twice a year at the time change. Well, it doesn’t quite work that way. The clocks are evidently stuck in some temporal rift which doesn’t correspond to our reality, they are almost always an hour off even though they are set to our time zone. When the secretary sets it to the correct time, it re-sets itself over night to be an hour off again. 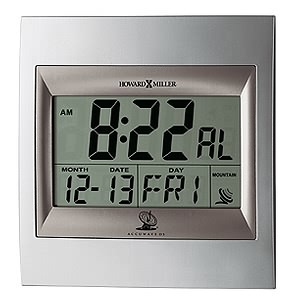 Seems to me it would have been simpler to just buy a normal battery operated clock and re-set it twice yearly. You are currently browsing the A Koplushian's Blog blog archives for August, 2011.